The focused project area is both the public right-of-ways of 7th, 9th, and D Streets, SE; and all land areas inscribed by those right-of-ways. In 2003, the Barracks Row landscape architecture firm of Oehme, van Sweden & Associates was asked by community members to develop a preliminary concept to improve the functionality and aesthetics of the Eastern Market Metro Plaza. The concept sketch served as a starting point for the discussion, and the idea of improving the Plaza was subsequently received positively by the community. 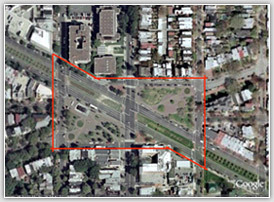 The project went on hold while the U.S. Congress transferred the plaza land parcels to the government of the District of Columbia, and in 2008 planning for the plaza was reinitiated by Barracks Row Main Street (a non-profit community organization). Barracks Row Main Street has funded the study project and has contracted with Weinstein Studio to select a team of experts in urban design, landscape architecture, traffic and transportation, cost estimating and urban tree consulting to collaboratively develop alternative concepts. The project's first phase is data gathering, inventory and analysis of existing conditions. Data gathering and analysis has begun but has not been completed. The October 1 Community-wide Outreach Forum meeting is part of Phase 1 and is for the purpose of obtaining community input. Phase 3 of the Study will be to obtain community input for the alternatives, after which a Preferred Alternative will be selected. It is expected that the final report for the Urban Design Study from the design team will not be completed until the summer of 2009. After completion of the Urban Design Study, the next steps will include government review and implementation initiatives if the project is to move forward. Given the typical length of time for projects such as this, it is estimated that after completion of this study in 2009, it will be a minimum of 3 - 5 years before any actual construction will begin on site. Copyright Â© 2008 Capitol Hill Town Square.. All Rights Reserved.